The first image, together with the painting's specifications, comes from the Archive and Image Library of Peter Nahum at the Leicester Galleries, London. Many thanks. Peter Nahum Ltd, London has most generously given its permission to use in the Victorian Web information, images, and text from its catalogues, and this generosity has led to the creation of hundreds of the site's most valuable documents on painting, drawing, and sculpture. The other photographs, and the captions and commentary, are by Jacqueline Banerjee. The sketch is reproduced by kind permission of the Oatlands Park Hotel, but you may use the others without prior permission for any scholarly or educational purpose as long as you (1) credit the photographer and (2) link your document to this URL or cite it in a print document. Click on all the images to enlarge them. 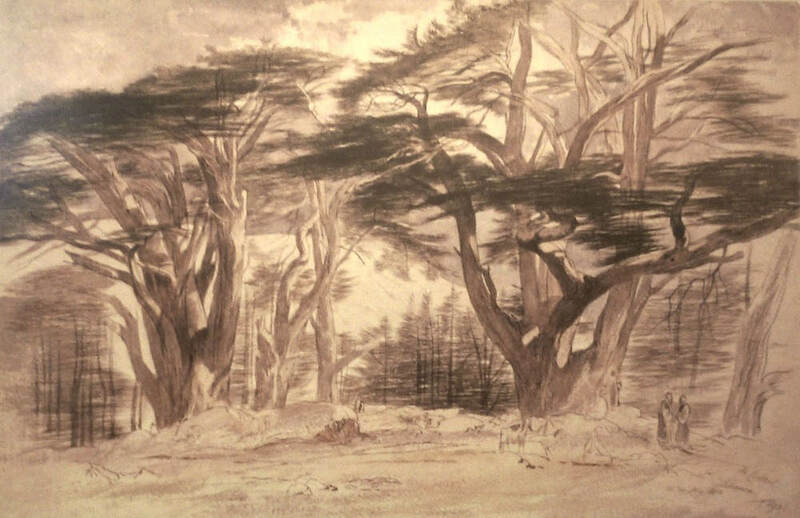 The Cedars of Lebanon by Edward Lear, 1812-1888. Copyright ©2014 Peter Nahum. All Rights Reserved. The painting is signed and dated 1861. Oil on canvas: 68cm high x 113.50cm (44.69 inches) wide. Provenance: Charles J. Roundell, M.P. for Grantham and Skipton, and thence by descent (all information from Nahum). Commissioned by Lear's friend Roundell himself, this is a version of an important work with a chequered history: "Received unfavourably at the Royal Academy in 1862, it was the cause of much bitterness" (Nahum). In a letter to another friend, Chichester Fortescue, dated 9 August 1867, Lear went so far as to write, "Sometimes I consider as to the wit of taking my Cedars out of its frame and putting it in the border of coloured velvet, embellished with a fringe of yellow worsted with black spots, to protypify the possible proximate propinquity of predatorial panthers — and then selling the whole for floorcloth by auction" (qtd. in Nahum; found in Later Letters 86). Yet it was much praised as well, and two buyers for paintings of this title are listed in the appendix to Lear's earlier letters (Charles Roundell himself, p. 226; and Lady Ashburton, p. 283). Lear sold to the latter at a lower price than the high one of 700 guineas he had wanted for it, "when ... short of cash early in 1868." The after-history of this version was sad: when Lady Ashburton died, apparently, "it went at her sale for a mere £5 and disappeared" (Levi 193-94). Fortunately, however, Roundell's has come down to us, and, since this was clearly a favourite subject for Lear, there are some other similar versions as well. 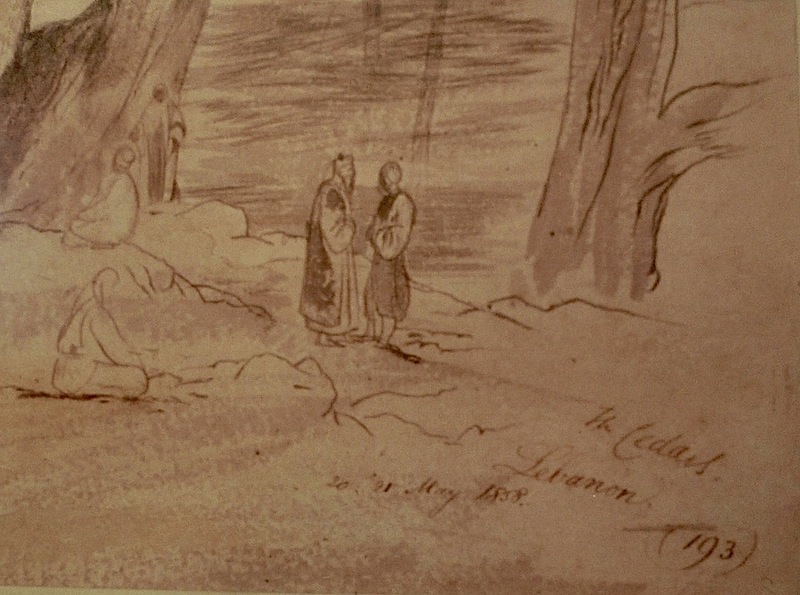 Print (it seems) of a preliminary sketch for the painting, framed and on display near the lobby of the Oatlands Park Hotel, Weybridge, dated May 1858. We know a good deal about the origins of the work. Although Lear had travelled in the Middle East, and indeed undertook his most extensive tour there in 1858 (see Tromans 105-6), his time was limited. As in the case of other pictures, he found he still needed a more leisurely contemplation in order to work up his landscapes: "Individual foreground details and studies of foliage were often painted from local sources" (Lambourne 105). Thus, to complete a view of the Cedars of Lebanon that had so impressed him, he went looking for good specimens when home again in England. Fortunately, some such specimens were to be found within easy reach of London. 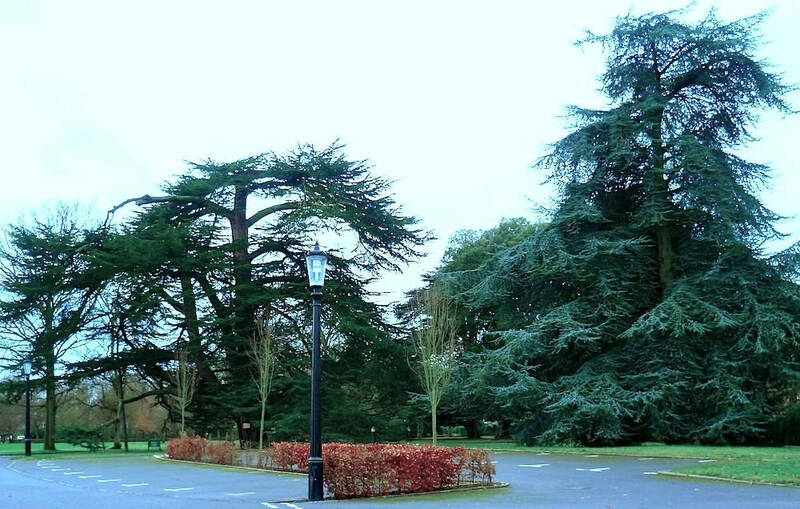 Lear could hardly have done better than the ancient and famous cedar trees on the estate of the Oatlands Park Hotel in north Surrey. The most imposing one now has a sign on it, that reads, "This is one of the first Cedars of Lebanon imported into England. It is believed to have been planted here by Prince Henry Otelands [sic], the youngest son of King Charles the First." Left: The trees as they are today. Right: A corner of a sketch, carrying Lear's title, date, and a number "(193)", suggesting that it may be one of a print sequence. Notice that the figures, though so lightly sketched in, are similarly positioned and garbed to those in the Roundell oil-painting — for which it was clearly the basis. Left: The exterior of the hotel today. 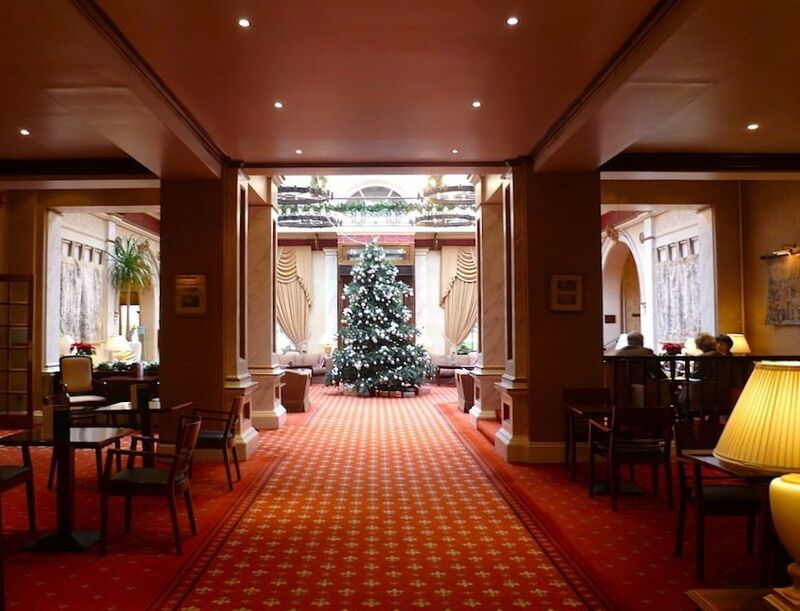 Right: Hotel interior, looking towards the lobby, at Christmas-time. It is interesting to catch a glimpse of Lear at work. An artist's life was a restless one, but here at least the accommodation was good. Not just good, in fact, but top class. 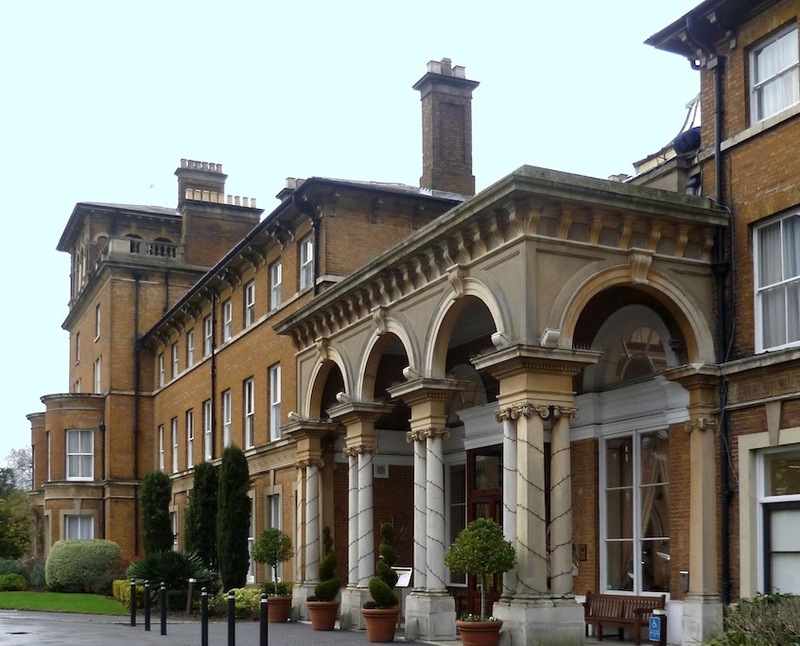 Oatlands Park Hotel, which lies in Weybridge, just on the outskirts of Walton-on-Thames, was well known. Established in 1856 on the site of a royal residence, the hotel there had many famous guests in the Victorian period. Besides Lear, these included the actress Fanny Kemble, whose family had a cottage in Weybridge; Emile Zola, who came to Weybridge during his exile from France; the Radical politician Sir Charles Dilke; and Anthony Trollope, always on the move. Lear was quite comfortable here, writing to another friend, Lord Carlingford, on 30 September 1860 that he hoped he would come and visit because he "would enjoy this place," explaining in his idiosyncratic way that he liked the "nice broad terrace walks, & a wonderfully lovely view over the river Temms & the surroundiant landskip." Describing his present circumstances, he went on, "Them as likes private rooms, can have them. But, I & some 20 more live in public I have a large light bedroom, delightful to behold, & wanting for nought." Nevetheless, when weather permitted, Lear could work on his painting. Since Lady Ashburton's version "disappeared," it is lucky that there are other versions of it, including a delicate water-colour of the same title, showing the trees more obviously on the crest of a hill. Dated 1858, it is held in the Victoria and Albert Museum's Prints and Drawings Study Room (see "Cedars"). As for the splendid oil-painting shown above, from Nahum's Archive and Image Library, Roundell and his wife were both friends of Lear's (e.g. see Levi 220), and Roundell's commission meant another reward for the artist's labours. And as for the (presumed) print of the sketch, it hangs proudly on the wall of the hotel as a memory of one of its most special guests. 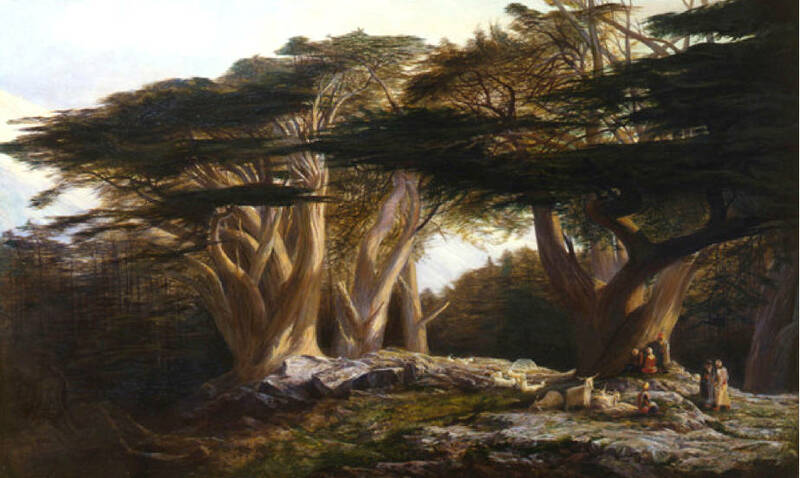 "Cedars of Lebanon" V&A Collections. Web. 7 January 2014. Lear, Edward. Later Letters of Edward Lear to Chichester Fortescue (Lord Carlingford), Frances Countess Waldegrave and others. . Ed. Lady Strachey. London: T. Fisher Unwin, 1911. Internet Archive. Web. 7 January 2014. _____. Letters of Edward Lear to Chichester Fortescue, Lord Carlingford, and Frances Countess Waldegrave. Ed. Lady Strachey. London: T. Fisher Unwin, 1909. Internet Archive. Web. 7 January 2014. Lambourne, Lionel. Victorian Painting. Pbk. ed. London and New York: Phaidon, 2003. Print. Levi, Peter. Edward Lear: A Life. London: I. B. Tauris, 2013. Print. Tromans, Nicholas. "The Orient in Perspective." The Lure of the East: British Orientalist PaintingEdward Lear: A Life. Ed. Tromans. London: Tate Publishing, 2008. 102-09. Print.